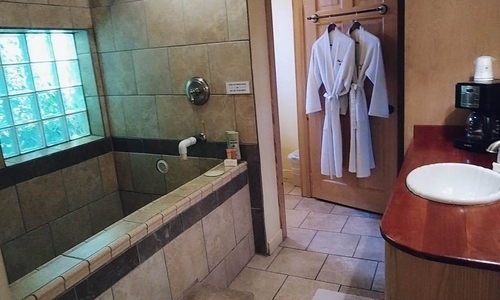 Enjoy your own private geothermal mineral tub in the comfort of your room. 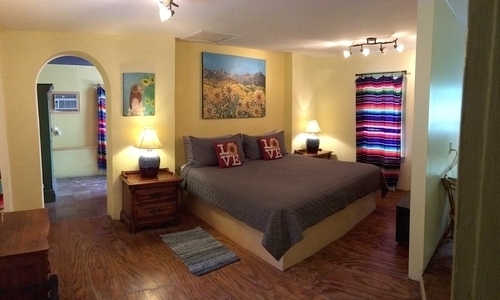 Each room offers a variety of amenities, surrounded by Southwestern designs. Check-in time begins at 3:00 pm and check-out time is 11:00 am. Click Here to view our other policies. 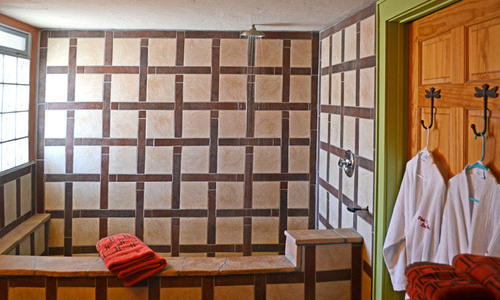 The Waterfall Room is the first room in town to have had its own private hot mineral water tub, which is large enough for two people and complete with a shower. 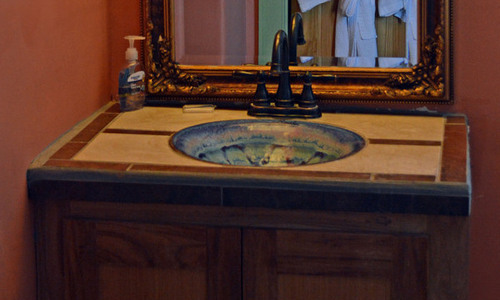 This beautiful room is decorated in a Santa Fe style reminiscent of Old New Mexico. 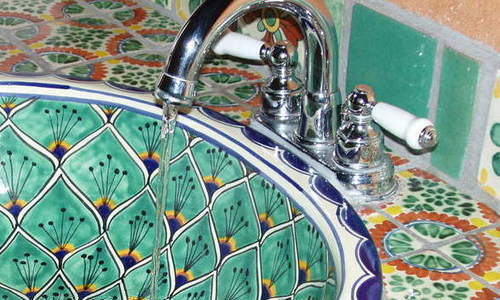 It's accented by antique Mexican tiles, handcrafted Southwest furnishings, and paintings by local artists. 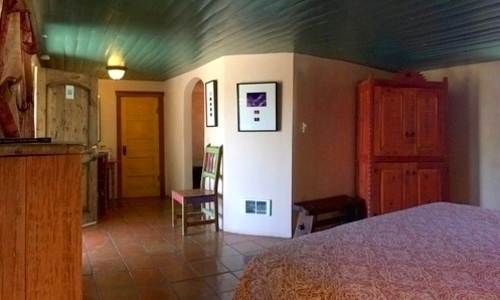 Named after the flowers that bloomed when this room first came to market, the Morning Glory Room is a cozy Southwest adobe-style room with Saltillo tiled floors, beadboard ceilings and hand-crafted furnishings. 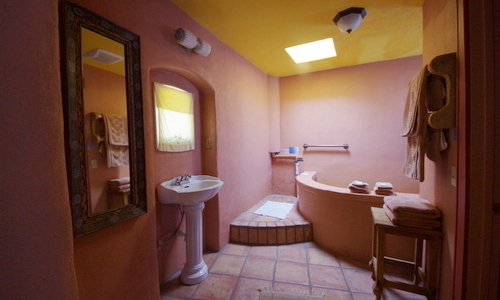 A spacious bathroom houses a large two-person hot mineral bath. 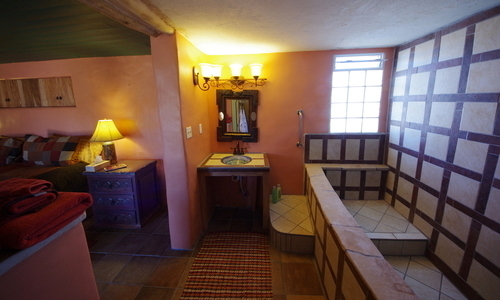 The bath contains a shower and is located right in the room. 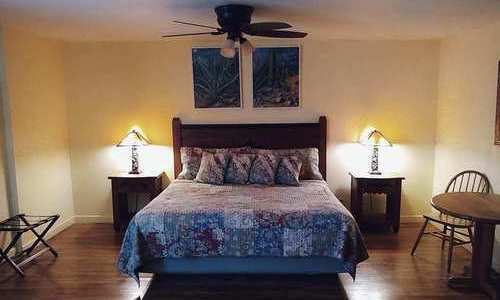 Named after the towering trees just outside the room, the Palms Room is one of our largest guest rooms. 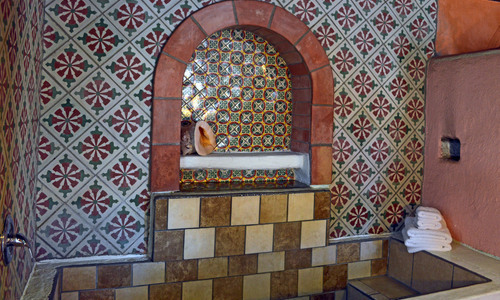 The decor includes Saltillo tiled floors and framed photos by local artists. 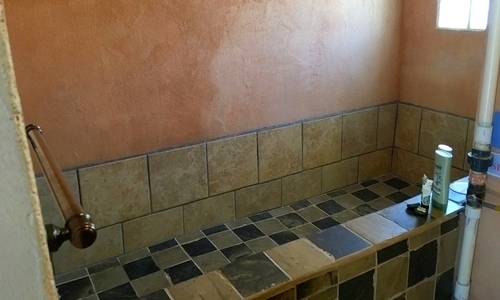 The bathroom has a beautifully tiled hot spring mineral tub, with a shower and tiled vanity. 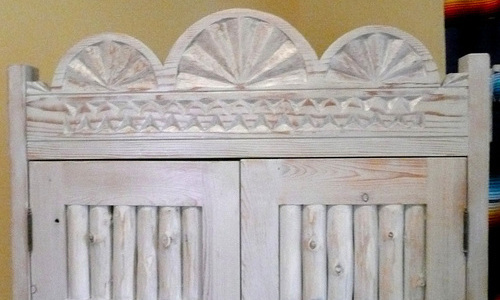 There is a king-size bed and handcrafted cabinet and other furnishings. 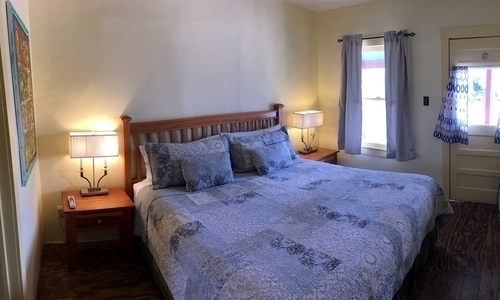 The Datura Room is a large room and is great for families of three. 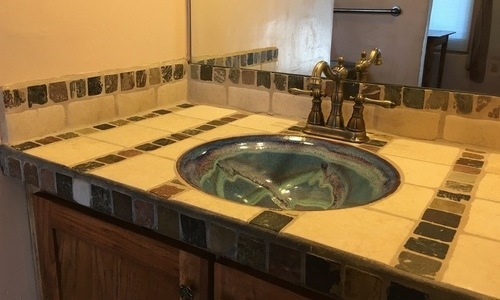 The bathroom has a beautifully tiled hot springs mineral tub, a shower, and tiled vanity. 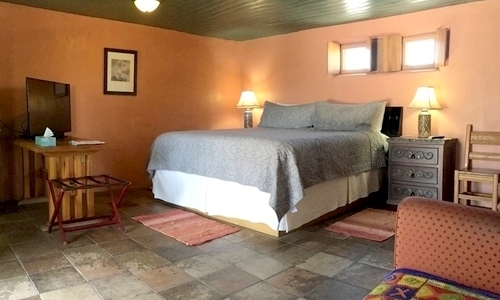 The room features a king-size bed and a fold-out couch. 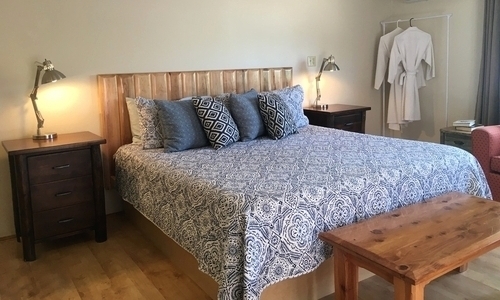 The Eucalyptus Room is a two-room suite and is excellent for families. 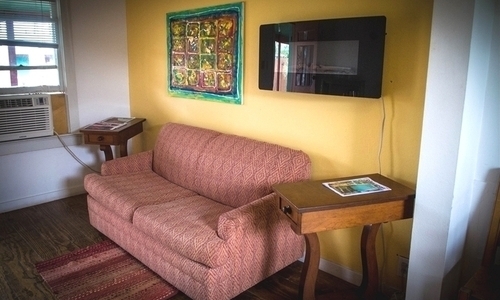 Relax in the sitting room, complete with a foldout couch. 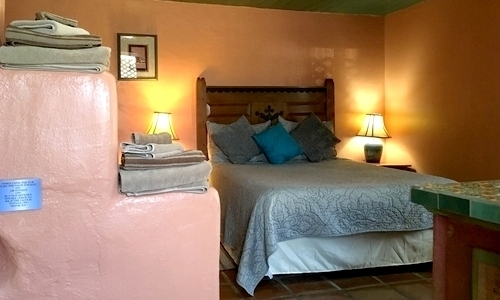 The bedroom features a king-size bed and bathroom with a shower. 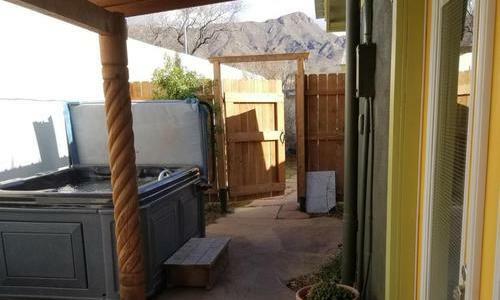 Through the back door, you will find your own private enclosed geothermal mineral tub and patio seating. 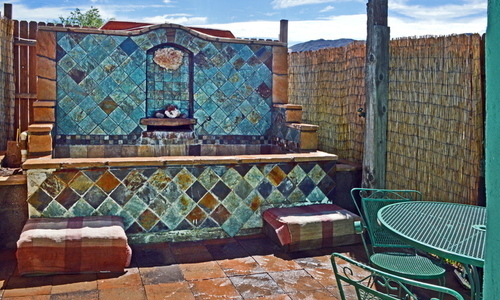 The Cactus Room is a two-room suite with its own tiled geothermal hot springs mineral tub, a living room, and a bedroom. 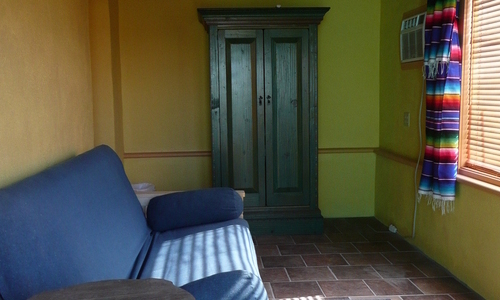 The living room includes a day bed. 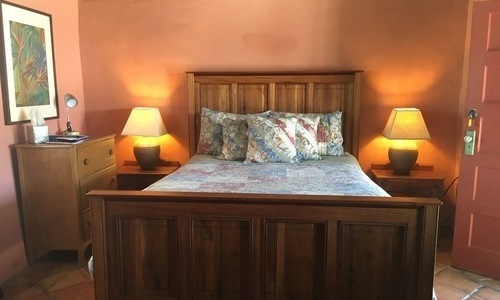 The bedroom features a queen-size bed and a lovely view of the courtyard. 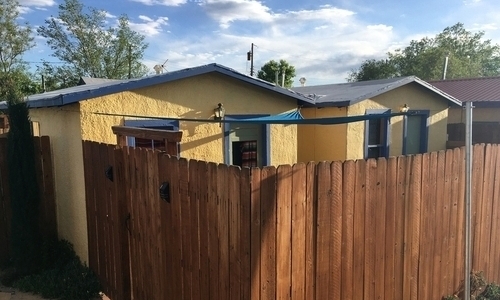 Just steps away from the main campus is a duplex compound that houses two rooms, one of them being the Sunflower Casita. 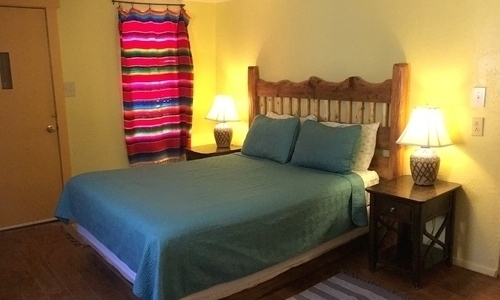 Guests love the quiet and peaceful feel of the Casita. 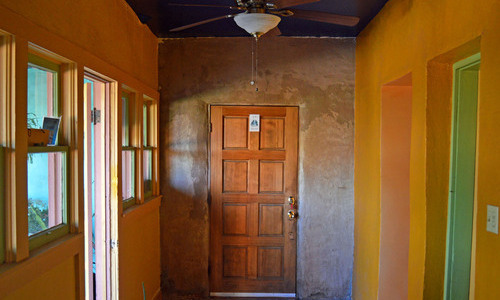 It's a three-room suite with a bedroom, sun room, and dining area. 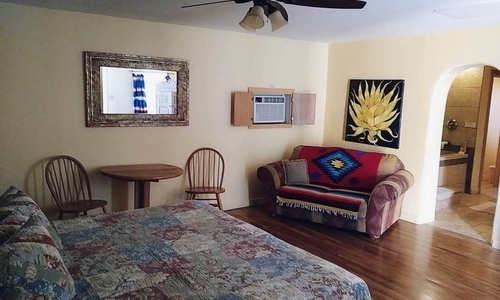 There is a king-size bed in the bedroom, and the sun room has a futon couch. 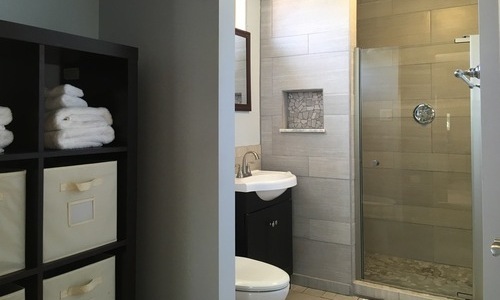 This room boasts a large family tub in your own private enclosed patio area just steps from your room. 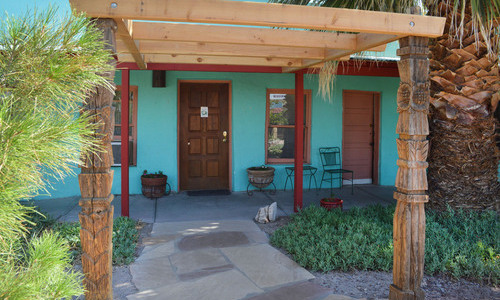 The Agava Room is adjacent to the Sunflower Casita in our annex across the street from our main campus. 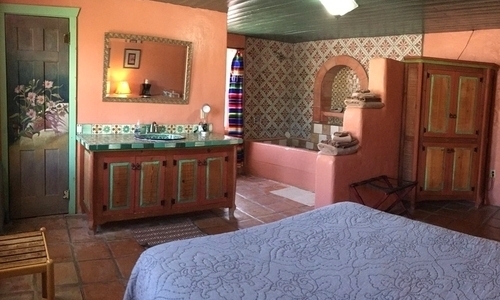 The Agave Room is very spacious, with wood and tile floors, ornate furniture and frames, and agava paintings from local artists. 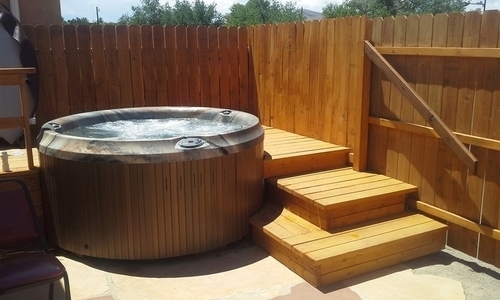 The hot mineral tub is large enough for two people and it has a shower. 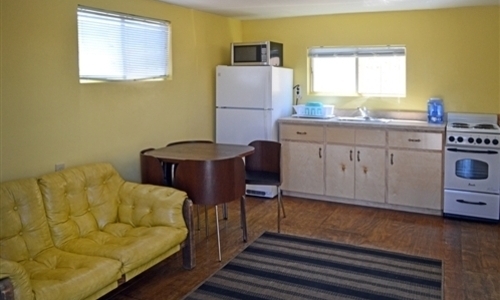 The Yellow Cottage is a two-room unit with a living area, full kitchen, bed room, and a Jacuzzi-style hot springs tub on the patio. 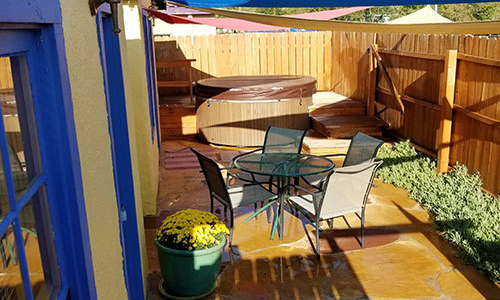 We fill your private hot tub with fresh geothermal mineral spring water for every new guest. 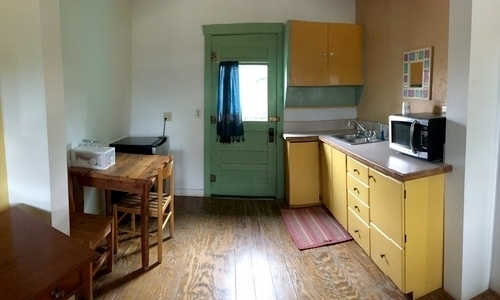 The Cottage is a part of T or C history. 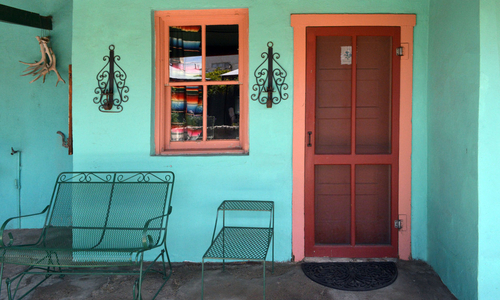 In the early part of the 20th century, these cottages were used to house the Elephant Butte Dam construction teams. 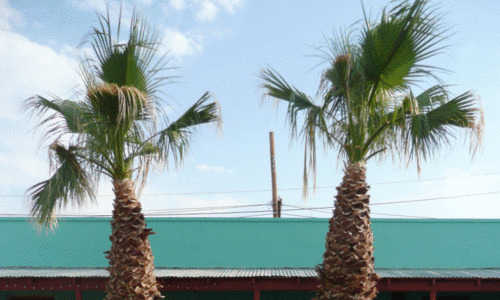 After the dam was completed, they were floated down the Rio Grande for use as housing in T or C. You can see many of these "floaters" still in use around town. 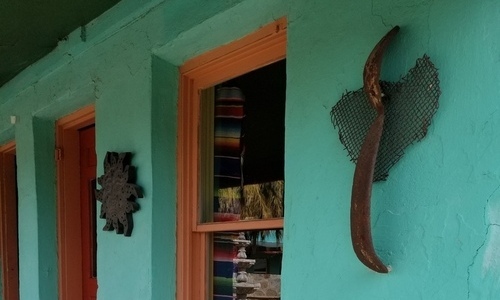 Find quiet serenity on the banks of the Rio Grande, a natural flyway for migrating and local birds of all kinds. 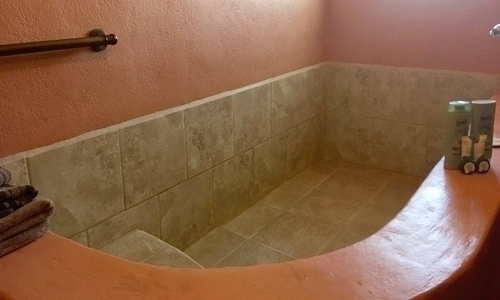 The River Casita has a Jacuzzi-style hot tub in your private enclosed patio. 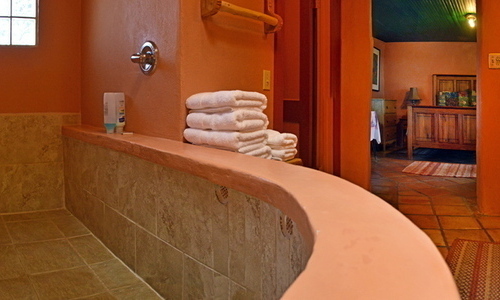 We fill the hot tub with fresh geothermal mineral spring water for every new guest. There are beautiful views of Turtle Back Mountain. Yes, there is actually a natural carved image of a turtle in the rock face. 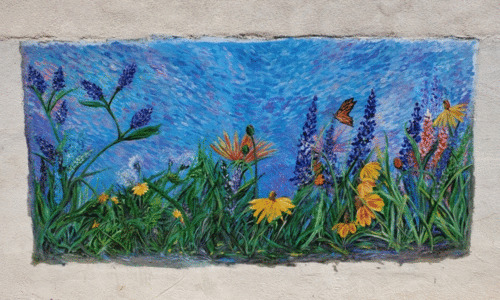 There are many opportunities for hiking, biking, canoeing, fishing, and just relaxing in nature. 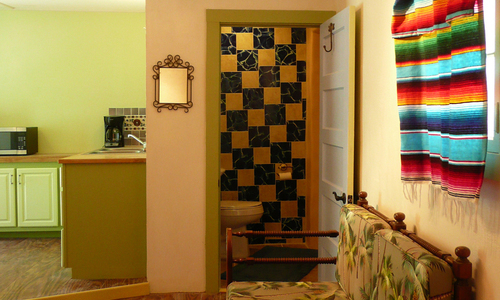 Inside your casita you will find everything you need, including a kitchenette. Just bring your food and spices. Bullocks grocery store is only 5 blocks away. 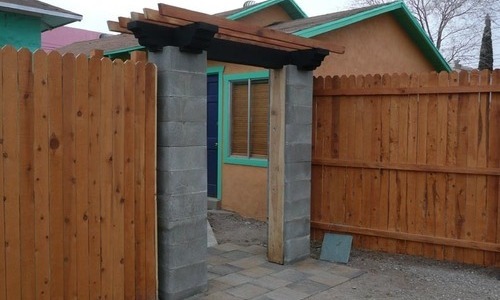 The River Casita is a private small house in a quiet neighborhood. 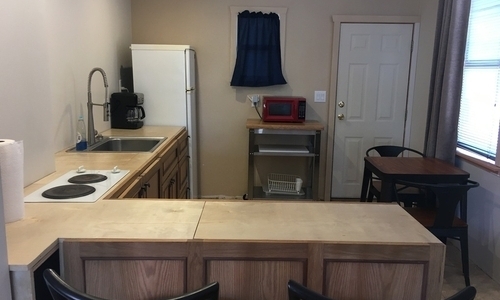 *For rooms with a max occupancy of three or four, if there are more than two people in the room, add $20 per night for each additional teen or adult. No additional charge for children under 13 years old. 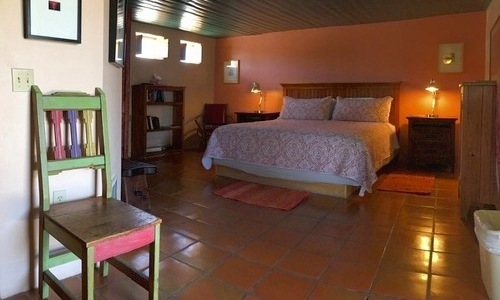 Cancellation Policy: Minimum 72 hour advance notice cancellation required. $25.00 cancellation service fee for all cancellations. Smoking Policy: No smoking in the rooms. Outdoor ashtrays are available. Please don't smoke or bring your last puff into the rooms. Violators will be charged $200. Please bring a well-behaved owner. Please get a good brushing before coming for your visit. Bring your own bedding and please stay off the furniture. Keep your paws off the plants. Any damage will be charged to your owner! No urinating in the courtyard. There are plenty of places out back. Make sure your owner keeps you on a leash or in his arms at all times. No free roaming allowed. If you bark when your owner leaves, your owner must take you with him.